Each artistic glass award is slightly different due to the nature of the custom work required to hand make each award. For an award that will stand out above the rest, these unique awards are an excellent choice. 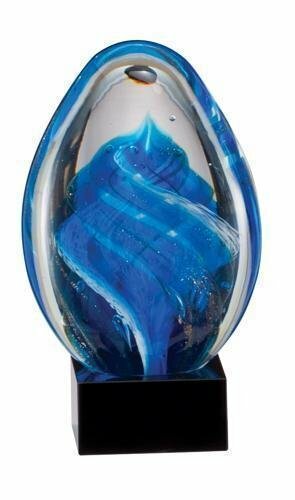 This artistic glass award is personalized with a laser engraved black brass plate with a silver border and engraving. This free form Celebration Glass Art Sculpture is the ultimate in elegance and style. 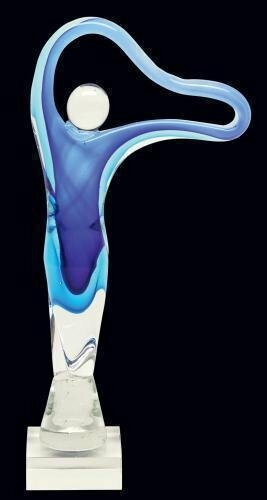 Standing 17 1/2" tall the sculpture takes the shape of a person with flowing hands all done in stunning shade of blue while sitting atop a glass bass. This item would be a hit with any recipient as it is perfect for home or office. Blue / Clear 17 1/2"